The 11-screen, dine-in theater by Studio Movie Grill that's being proposed for Willow Grove Park Mall owned by Pennsylvania Real Estate Investment Trust (PREIT). Bye bye, J.C. Penney and hello, Hollywood. Mall owner Pennsylvania Real Estate Investment Trust confirmed late Monday that it is finalizing a lease with theater operator Studio Movie Grill, to bring an 11-screen movie theater with a bar and lounge restaurant in the space formerly occupied by anchor J.C. Penney at Willow Grove Park Mall. SMG of Dallas runs SMG Upper Darby, which opened in 2015 on South 69th Street, featuring nine screens and a bar and lounge. A prototypical SMG theater in other states includes about 1,100 luxury stadium recliner seats, a full service bar and lounge, and patio seating for 85 guests within a 40,000-square-foot site. The new Studio Movie Grill, one of only four dine-in movie theaters in the region, is part of the mall owner's strategy "to diversify the shopping experience for consumers," said Joseph Coradino, PREIT's CEO. "Dining and entertainment represent an immensely popular segment in PREIT malls as retail continues to evolve – currently making up 20 percent of our occupied retail space," up from 2 percent in 2008. An opening date has not yet been determined, he said. Coradino said PREIT first began looking at operators to fill the former J.C. Penney space after it became known in January 2017 that the anchor would be shutting down, part of the general decline of the department store sector. 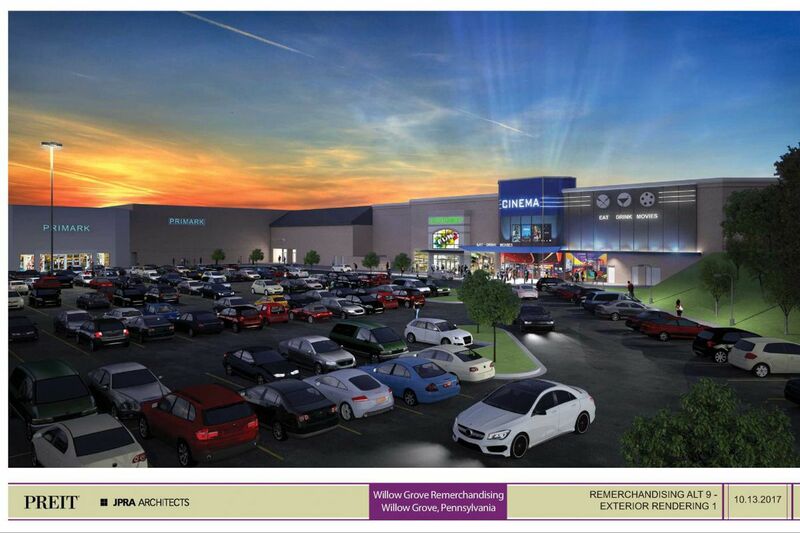 A new theater at Willow Grove Park Mall replaces J.C. Penney’s former spot, pictured here. Over the last five years, thousands of stores belonging to Macy's, Sears, J.C. Penney, and other chains, have closed, leaving mall owners scrambling for replacements, with many increasingly turning to entertainment concepts. PREIT also owns Plymouth Meeting Mall, where it has added a Legoland Discovery Center and 5 Wits action adventure center in the last 18 months. In Delaware County, BET Investments of Horsham, run by developers Michael Markman and Bruce Toll (co-founder of Toll Bros.), is re-creating the old Granite Run Mall in Middletown Township, which shut down in summer 2015. It will become the Promenade at Granite Run, and will feature a 68,000-square-foot Frank Theatres Cinebowl & Grille, which is expected to open sometime this year. SMG did not respond to requests for comment, but according to its website, it's been operating theaters for 25 years and has venues in 10 states, including Texas, California, Florida and North Carolina. It's one of the leaders in creating the dine-in concept, combining first-run movies with full-service dining. For PREIT, this will be its second new movie theater in the works in the region. It owns 22 malls in the Mid-Atlantic, with seven in the Philadelphia market, including Cherry Hill and Exton Square. It has existing movie theaters at Moorestown and Plymouth Meeting Malls. PREIT's stock has tumbled about 20 percent from five years ago with the rapid shift to online shopping that has sapped traffic to its malls and the general decline in the department store sector. PREIT spokeswoman Heather Crowell said the public perception that retail is dead has been fueled by much negative coverage. PREIT stock, which traded at about $11.43 on Tuesday, is down 35.57 percent from a year ago. It announced plans last year that it was adding an eight-screen multiplex under AMC Theatres to the former Gallery Mall downtown that's being transformed into the $325 million Fashion District Philadelphia. The rehabbed mall is scheduled to debut in November. AMC Theatres, which has a projected November 2019 opening, will serve as the far western bookend for the mall. In the permitting process for the dine-in theater, PREIT included numbers in a community-impact statement, showing that Willow Grove was an underserved "film zone." There are only three other existing dine-in movie theaters in the Philadelphia region: Movie Taverns in Exton, Collegeville and Flourtown. 207,973 mall shoppers in the Willow Grove trade area say they have attended a movie at a theater at least once in the last three months. 43,000 mall shoppers in the trade area say they have attended a movie at a theater four or more times in the last three months. Willow Grove Mall shoppers are 87 percent more likely to attend a movie four or more times over a three month period than others in the Philadelphia area.